Waiting tables is one of the most hectic and tiring jobs. Did you know you can burn between 150 and 250 calories per hour waiting tables? Having a pair of comfortable work shoes with excellent support and durability is essential for any waiter or waitress running around for eight hours or longer. An ideal work shoe in the food service industry will have comfortable insoles and outsoles that are slip-resistant and shock-absorbent. We’ve reviewed the top-rated shoes for waitresses and waiters to give you the top options. While most work shoes for the service industry resemble an athletic shoe, there are other options for waitresses who want a classier look. If you work in a mid-to-upper scale restaurant, the basic work tennis shoe is not going to cut it. 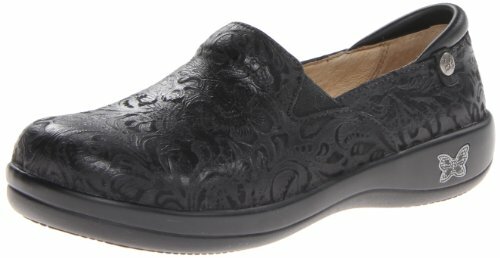 The moderately-priced Alegria Women’s Keli Professional Shoe is a fitted loafer that comes in a variety of styles to suit your employer’s uniform policy. It has a 100% stain-resistant Nappa leather upper and a leather interior lining for increased durability during long work weeks. 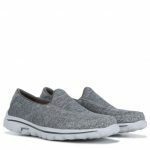 This slip-on shoe has elastic gorings on the sides to stretch the upper so that you can slide right into your work shoes before a busy shift. The slip-resistant polyurethane outsole has excellent traction to prevent slipping on wet surfaces. This outsole comes equipped with a 1.5” heel and extra support along the ball of the foot for shock-absorption when walking on hard floors. The Alegria Women’s Keli Professional Shoe is all about comfort, a necessity for any waitress. The interior’s “Perfect Fit” insole combines latex, cork, and memory foam. This provides cushion and support with extra bounceback. A roomy toe box and padding along the top of the heel and the attached tongue make the Keli Professional Shoe comfortable enough for all-day wear. There is a mild break-in period that shouldn’t last longer than a few shifts. Alegria manufactures their shoes in European sizes, so you’ll need to use a sizing chart. They do run small and narrow, and half-sizes should order a size up from your standard size. The “Perfect Fit” insole doesn’t have much arch support, but it is removable for a quality insole or orthotic that caters to your needs. Alegria’s Keli Professional combines durability and comfort in a sophisticated design, making it our choice for the best work shoe for waitresses. 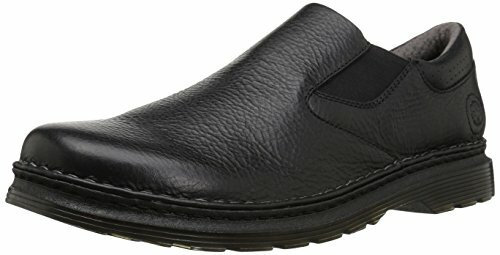 Much like the Alegria Keli Professional, the Dansko Women’s Professional Mule is a comfortable slip-on shoe designed for safety in the workplace. Available in many colors and designs, the shoe has a 100% leather upper that holds up to messy conditions. The upper is easy to maintain and easy to clean with a slightly damp cloth. A thick polyurethane outsole, with a 0.75” platform and a 1.5” heel, provides shock absorption against tile or cement floors. With a roomy toe box and a wide heel, the Dansko has a slightly curved bottom that propels you forward as you walk. A polyurethane midsole stabilizes your foot and supports your natural gait. This reduces the stress on your feet as you walk, relieving foot fatigue. The soft memory foam insole is not removable if you need a custom orthotic. The Dansko Women’s Professional Mule runs narrow but large. Ideal for women with long, thin feet, this fitted shoe can feel tighter on women with a wider foot. Although the outsole has a zig-zag traction pattern along the heel and the forefoot, these lugs are not deep. This can pose a problem on extremely slippery floors. Without a deep traction pattern, the Danskos are better for front-of-the-house staff only. If you move back and forth between the dining room and the kitchen, another model will suit you better. The stability features in the midsole and outsole can make the shoe feel heavy, but you will get used to the weight during the mild break-in period. Although the Dansko Women’s Professional Mule has some drawbacks, the anti-fatigue technology and comfortable memory foam insole make this expensive shoe worth the investment. 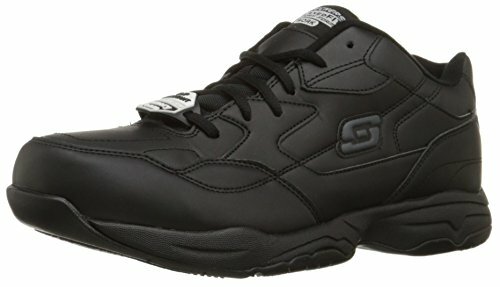 For women who need a more casual work shoe, the Skechers for Work Soft Stride-Softie Slip-Resistant Lace-Up Shoe is a budget-friendly athletic safety shoe. It comes with all of the protective features that you need for restaurant work. The 100% leather upper has breathability vents from the toe to the ankle that keep your feet comfortable. Although the shoe has a lace-up design, it also has a heel pull tab for more convenience. This lightweight work shoe has a padded tongue and ankle collar for more comfort. A removable, cushioned polyurethane insole contours to the shape of your foot, providing stability with every step. A thick 1.5” heel is shock-absorbent, reducing the stress on your feet as you walk. Despite the shoe’s comfort, there is little arch support. If you have high arches, the insole removes for a replacement insole or orthotic. There is a mild break-in period for the leather upper, after which you will feel an increase in flexibility. These shoes run small and narrow, so you should order a size up from the athletic shoes you normally wear. Unfortunately, the Skechers for Work Women’s Soft Stride-Softie Slip Resistant Lace-Up Shoe doesn’t hold up well. They usually fall apart within six months to a year of consistent use. Since they run so low on the price point, you should invest in multiple pairs. Most waitresses prefer slip-on shoe designs since they reduce the chances of slipping on an untied shoelace. The Merrell Women’s Jungle Moc Slip-On is a casual slip-on shoe that has made its way into the restaurant industry. For over two decades, the company has manufactured this model for their customers, who love their durability. The 100% suede upper holds its shape well, keeping the fit of the shoe consistent. A long-lasting rubber outsole has excellent traction, with deep grooves that stick to any slippery surface. With the heel tab, your feet slide right into this lightweight, comfortable shoe with an extra roomy toe bed for more comfortable wear. Although the suede upper doesn’t breathe that well, an interior mesh liner helps alleviate this by promoting air circulation. Known for their stability, the Merrell Women’s Jungle Moc Slip-On has a compression molded EVA midsole and a nylon shank for extra support. The air cushioned heel also relieves impact, relieving foot fatigue. These shoes run small and narrow, so you’ll have to order a size up. Long-time fans of the Jungle Moc observe that the current model is more narrow than previous models. 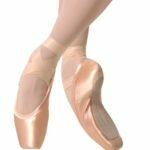 Although there are elastic gorings to stretch the upper when you slide the shoe on your foot, the opening may not be wide enough for women with wide, thick feet. One major downside is that it squeaks when you walk. If you work in a noisy restaurant, this won’t bother you a bit. 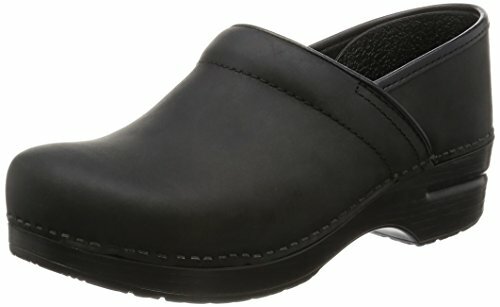 Although the moderate price tag may seem high for a slip-on shoe, the shock-absorption and thick tread make the Merrell Women’s Jungle Moc a great supportive shoe for waitresses who work long shifts. Skechers makes our list again, for a good reason: they make a durable and comfortable work shoe highly valuable for restaurant work. 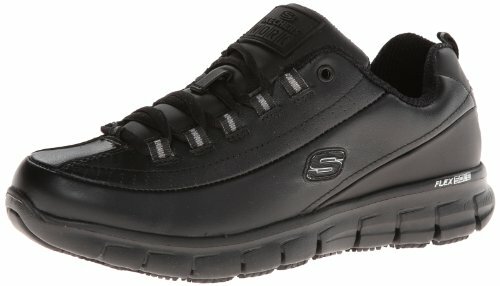 The Skechers Women’s Sure Track Trickel Slip-Resistant Work Shoes have a lace-up feature for a better fit. With deep tread, the slip-resistant rubber outsole is ideal for waitresses who float between the front and the back of the house. On the upper, side panels with breathable holes keep your feet more comfortable throughout the day. This flexible and lightweight work shoe has a shock-absorbent FlexSole midsole and removable memory foam insoles for more stability and cushion that you can feel by the end of your shift. The safety features of the Sure Track comply with safety and electrical hazard standards, but they can make the shoe feel heavy. There is a mild break-in period that lasts about a week. These Skechers run large, but they have a narrow fit. If you have a wider foot, you should order a size up. If you decide to invest in a pair of Sure Tracks, make sure you lace them with care. The cloth lace hooks are flimsy, and they can snap with rough lacing. The memory foam insole wears down quickly, especially if you work longer shifts. The insole is removable, quickly replaced with a pair of inserts. Although the upper is 100% leather, the shoe doesn’t hold up in heavy-duty environments. The Sure Track falls apart after about a year of consistent wear, but they will disintegrate faster in heavier-duty environments. This may discourage some buyers who see the moderate price tag. However, the sturdy tread and shock-absorbent midsole make the Skechers Women’s Sure Track Trickel Slip-Resistant Work Shoe a decent investment. New Balance is a famous, worldwide distributor of athletic shoes, and their focus on comfort and support has made its way into their line of work shoes. The New Balance Men’s MID626V2 Work Training Shoe is an update on a previous model, with more support to keep you comfortable. With a 100% leather upper that resists spills, this lightweight shoe has an oil-resistant and slip-resistant rubber outsole with good traction. You’ll stay firmly on your feet when walking back to the slippery kitchen from the dining room. Made for comfort, the ABZORB crash pad in the heel diffuses impact, relieving stress on your joints during long days on the job. With more cushion than its predecessor, you’ll feel more spring in your step as you walk from the injection-molded EVA midsole, which has more bounceback than compression-molded EVA. A durable shank in the midsole promotes stability on your feet, helping support your natural stride. There is no break-in period with the New Balance MID626V2, but the shoe does run narrow with a tight toe box. They also run large, so those with wider feet would do better with another shoe. The leather upper doesn’t breathe well, and the flimsy lace holes can break with firm lacing. Depending on how rough you are on your shoes, these can last you for six months to a year. If you work a large dining room, they wear down faster. Although they have a hefty price tag, the comfort and protection of the New Balance MID 626V2 make it our choice for the best shoe for waiters. 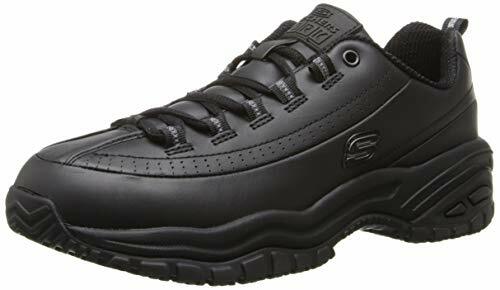 Waiters who work in fast-paced restaurants love the Skechers for Work Men’s Felton Slip-Resistant Relaxed Fit Work Shoe. 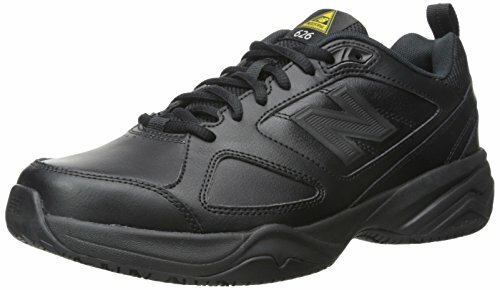 Their support makes long shifts more bearable, and they are a budget-friendly shoe that complies with safety standards. The 100% synthetic upper with reinforced stitching protects your feet against spills without ruining the material. With a shock-absorbent 1” platform and 1.25” heel, the nitrile outsole is slip-resistant and oil-resistant. This complies with OSHA standards for safety footwear in the food industry. A soft, fabric interior lining keeps your feet more comfortable and helps them breathe during the constant movement of waiting tables. With a padded tongue and ankle collar, the Felton cushions the top of your foot and your ankle for more support. A shock-absorbent midsole relieves pressure off of your feet from the impact of walking on hard floors. With a roomy toe box and a memory foam insole, this shoe supports your natural gait, fighting foot fatigue. The Feltons run narrow, and there is a mild break-in period to make the upper more flexible. Although the insole is very squishy and soft, it is glued to the inside of the shoe. Since memory foam doesn’t provide much arch support, this is a better shoe for men with medium to low arches. If you work in rough conditions or you work full-time, the Feltons will last you for about a year. One downside is that they can squeak quite loudly on smooth floors. In a noisy dining room, this isn’t really an issue. 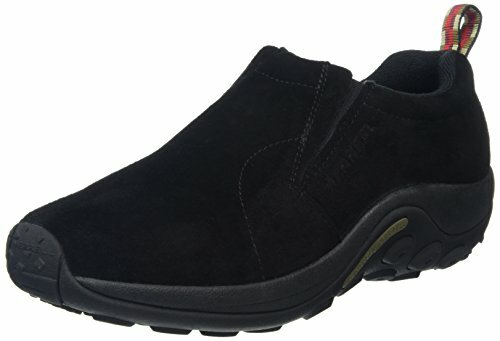 Since they are better walking shoes than standing shoes, the Skechers for Work Men’s Felton Slip-Resistant Relaxed Fit Work Shoe would be ideal for men who work in hectic environments. For men who work in upscale restaurants, the Dr. Martens Men’s Orson Loafer has a sophisticated appearance with the protection you need. 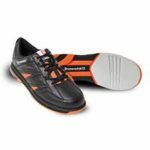 The slip-resistant and durable synthetic PVC outsole protects you from falls when walking on hard floors. A 100% leather upper has elastic gorings for convenient slip-on before your shift. Designed for all-day wear, the Orsons has a roomy toe box and a cushioned ankle collar. A moisture-wicking interior liner keeps your feet dry and comfortable during your long shifts. These shoes combine the support of shock-absorption with superior cushion. The 1” platform and 1.5” heel diffuse impact from the heel and ball of your foot for a more comfortable stride. An air-cushioned insole cradles your whole foot, making painful feet after your shifts a thing of the past. Although the insole provides comfort where you need it, the insert is not removable. It has little arch support, so men with high arches will need to invest in a gel insole for the proper support. The shoes run large and wide, so you don’t need to order up if you run between sizes. The Dr. Martens Men’s Orson Loafer requires special care: the leather upper scuffs easily. It doesn’t breathe well, so they are better suited for men who work in milder climates. These shoes will last you about a year of continuous wear, but the leather upper will outlast the interior cushion and the PVC outsole. The company built its reputation on quality footwear, making the moderate price tag of the Orsons worth the investment. If the Orsons aren’t sophisticated enough for your work environment, the Thorogood Men’s Uniform Classics Pomomeric Oxford Shoe is another moderately-priced option. With a shiny upper, they fit well with any upscale restaurant or banquet hall’s dress policy. These shoes are very lightweight, making them perfect for standing or walking all day long. A slip-resistant and oil-resistant Goodyear welt blown rubber outsole keeps you from falling on the most slippery floors. The shock-absorbent removable EVA memory foam insole has a polyurethane heel pad to diffuse impact from the joints in your foot. Although the upper doesn’t breathe well, a soft fabric interior with moisture-wicking technology keeps your feet dry all day long. As with most dress shoes, the Thorogood’s upper is not abrasion-resistant. This shoe will require some light maintenance to treat scuffs and creases that will stand out against the glossy upper. They do run large and wide, so you’ll need to order a size down from your regular footwear. Lace-Up design makes for a better fit, but the holes are not reinforced with a stronger material. They can break if you are rough with your lacing. The Thorogood Men’s Uniform Classics – Pomomeric Oxford Shoe is better for front of the house workers who rarely travel to the kitchen. The soles tend to wear down after about a year of consistent use, which decreases the effectiveness of the non-slip tread. The lugs are shallow, and you can slip on wet, smooth surfaces. 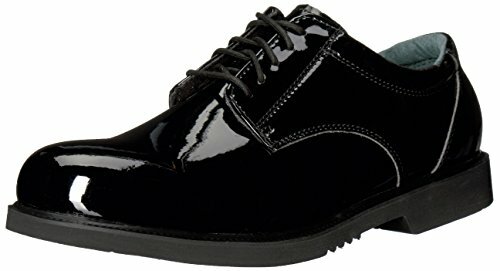 Overall, the Thorogood Men’s Uniform Classics – Pomomeric Oxford Shoe is a decent shoe for upscale waiters who need a traditional dressy shoe without sacrificing their comfort. Wearing lace-up shoes in a fast-paced restaurant can become problematic. Sometimes, the laces come untied, leading to tripping hazards. Some men prefer slip-on shoes to alleviate that issue. 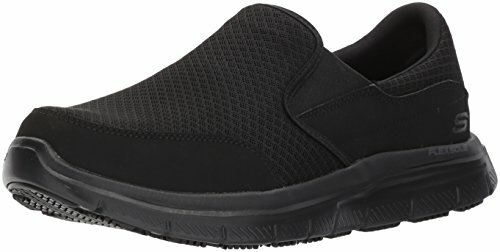 The Skechers for Work Men’s Flex Advantage Slip Resistant Mcallen Slip On is a convenient slip-on shoe that complies with most dress codes. They are ideal for a more casual environment: the fabric upper is breathable and comfortable, but it doesn’t protect your feet against spills. If you are on your feet for shifts that last more than eight hours, you definitely want a pair of Mcallens. The synthetic rubber outsole has amazing traction. With a shock-absorbent heel, the shoe has a memory foam insole and a padded ankle collar for more comfort. Elastic gorings stretch the upper as you slide it on, and a smooth, soft fabric interior helps your feet glide into the shoe without resistance. There is a mild break-in period with the Mcallens. The fabric upper can permanently stretch, so keep this in mind when ordering your shoes. Depending on how thick your feet are, you may need to order a size down. The back of the heel can break down with consistent use, so slide into these shoes with care. Some waiters use a shoe horn to help their footwear last longer. One downside is that the upper is harder to clean than work shoes with leather or synthetic uppers. 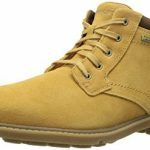 However, the Skechers for Work is a budget-friendly, comfortable work shoe ideal for men who work in restaurants with a more relaxed dress code. When you wait tables for a living, finding a comfortable and long-lasting work shoe that matches your employer’s requirements is a tall order. Although most restaurants have their own recommendations, most staff members have to find their own shoes. Depending on your needs, any of the shoes on this list would be a great option. 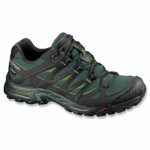 We recommend the Alegria Women’s Keli Professional and the New Balance Men’s MID626V2 Work Training Shoe as the best shoes for waitresses and waiters. Both shoes have the protection, stability, and comfort that you need to keep your feet from screaming after a long shift.